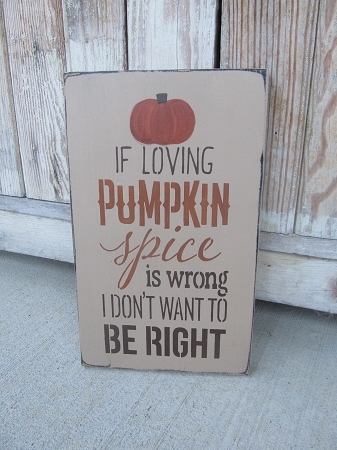 Primitive Autumn Fall Pumpkin Spice Hand Painted Sign. I don't know about you...but this is so ME in the fall. Ask my kids...I almost buy everything pumpkin spice flavored!!! I love this new sign too and am keeping one for myself! Painted a warm khaki tan color with distressed edges. I've hand painted a little pumpkin at the top and the Saying is: If Loving Pumpkin Spice is wrong, I don't want to be Right! Ain't that the truth!!! LOL Size is 12" long by 8" wide. Hanging options available, shown with a sawtooth hanger. Solid pine wood, made in the USA hand painted, and signed here at Gainers Creek by Heidi!! !